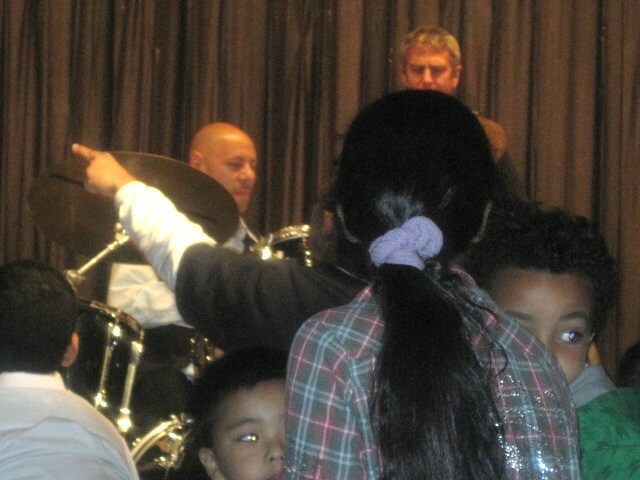 On June 9, 2010, the Kids for Coltrane and their Jazz Friends celebrated creativity and education. 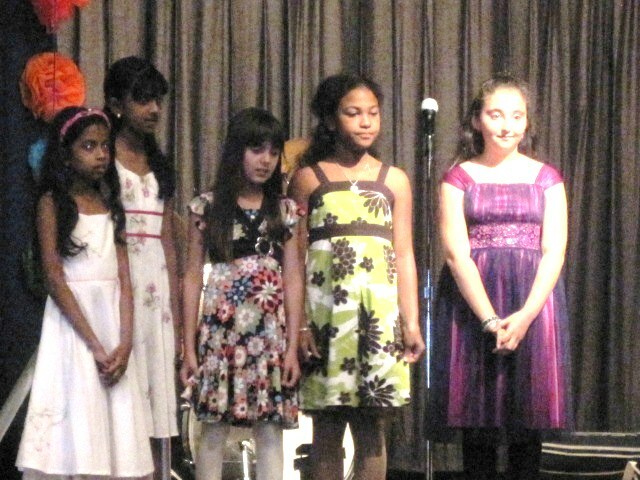 Our fabulous Gift of Song Concert at the Holliswood School in Jamaica Estates, New York helped raise the profile of jazz! 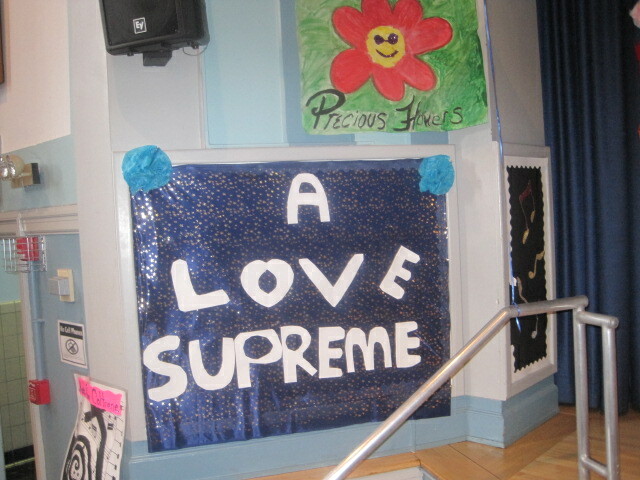 The children, musicians, and school community also raised funds to support the Friends of the Coltrane Home non profit. Our dream is to one day see John Coltrane’s Long Island home turned into a place of learning for everyone to experience and learn about jazz and the history of the artists who created America’s music. Funds also went to the Kids for Coltrane Music Library CD/DVD collection at the Holliswood School. 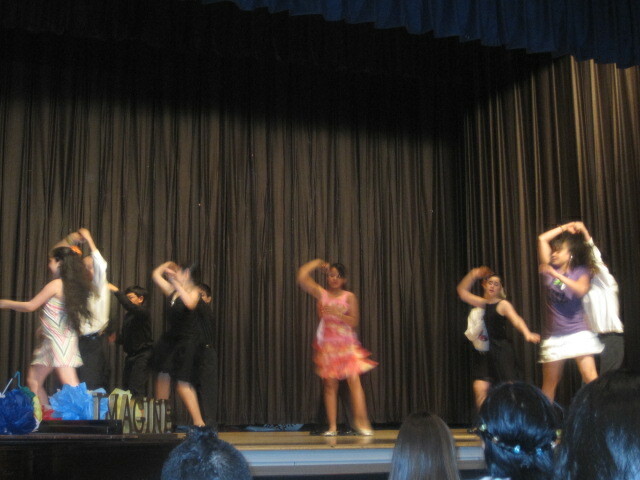 The Kids for Coltrane dancing to Joey Leone’s blues song The Girl from the Flower Shop. 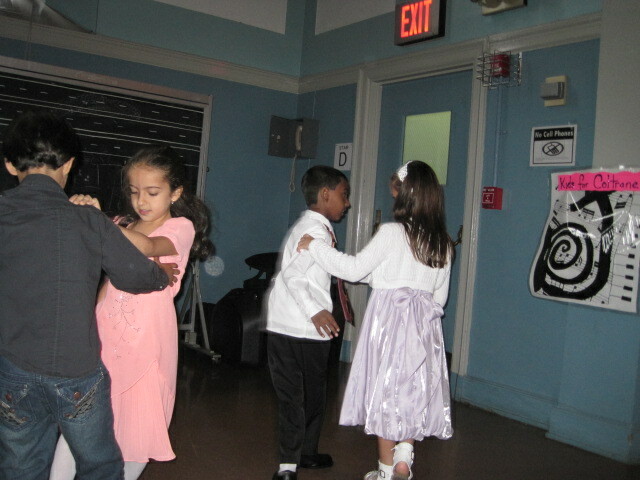 It was a joy to see the children smiling with glee as they did the West Coast Swing. 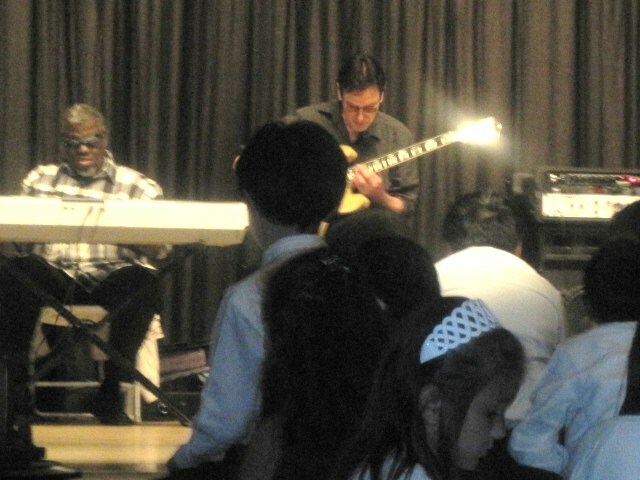 The children beamed as the room was filled with Buddy Guy’s voice singing Nobody Understands Me But My Guitar. Jazz stands on the foundation of the blues. 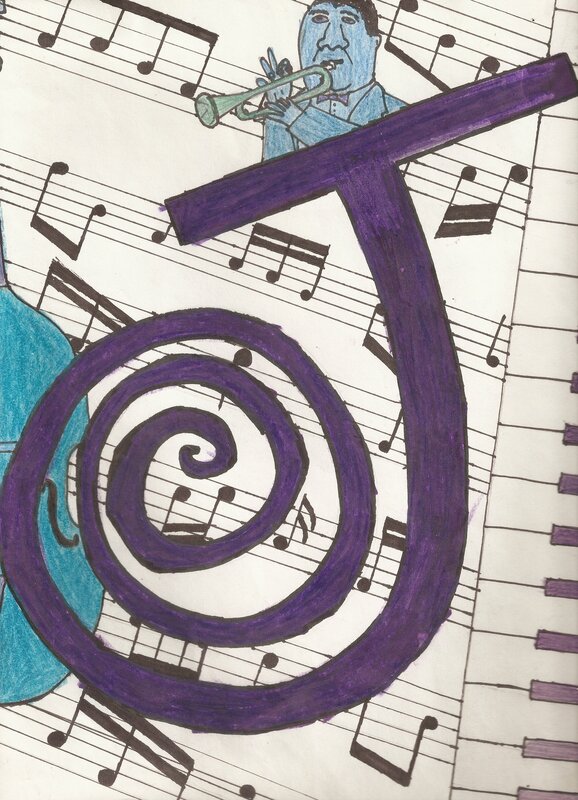 This music was created through pain and suffering which was transformed into triumphant music. The Kids for Coltrane did a wonderful job dancing the West Coast Swing. It was a joy for me to watch the children teach each other the dance and choreograph new steps during the year…just priceless! The Kids for Coltrane singing an original song entitled For the Children. 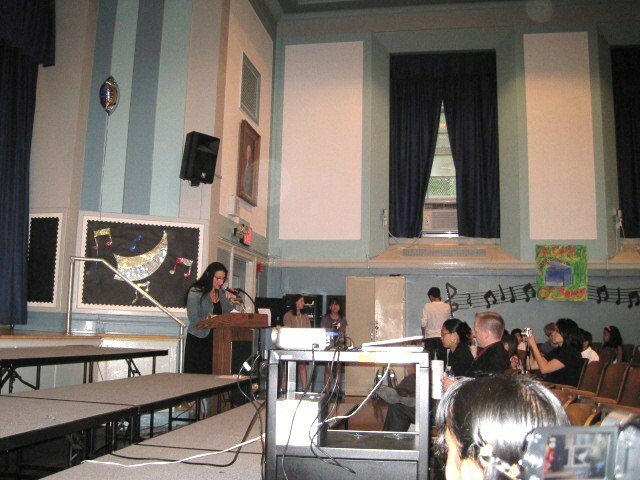 Music by Louis Vignapiano and lyrics by their teacher…that’s me Ms. Christine Termini Passarella. Lou and I dedicate this song to children all over the world! You can hear the song and read the lyrics on the Songwriting page on this site. 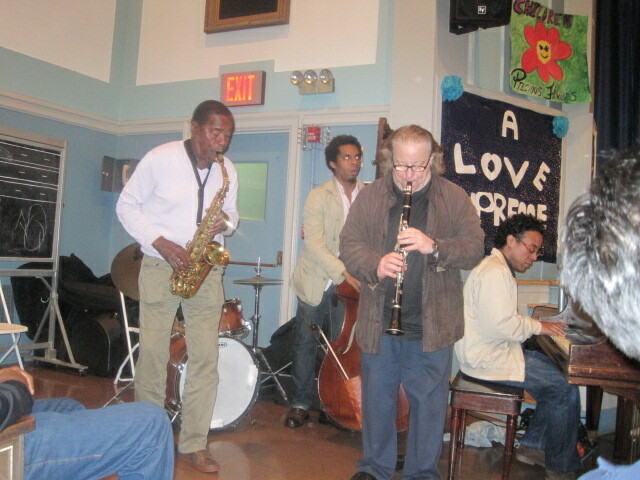 Jazz legend Sonny Simmons and the Cosmosamatics playing incredible John Coltrane songs for the children. Brilliance flowed through the auditorium! The Kids for Coltrane students listening to magnificent jazz music performed by the best! Michael Marcus proud of his band and telling the audience to “Give Peace a Chance!” During the evening the Kids for Coltrane also honored another music legend Mr. John Lennon. 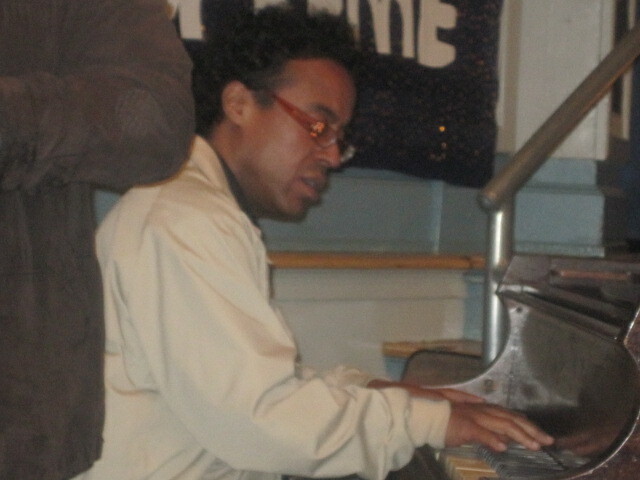 Sonny Simmons filled with uplifting and encouraging emotions during The Gift of Song Concert. 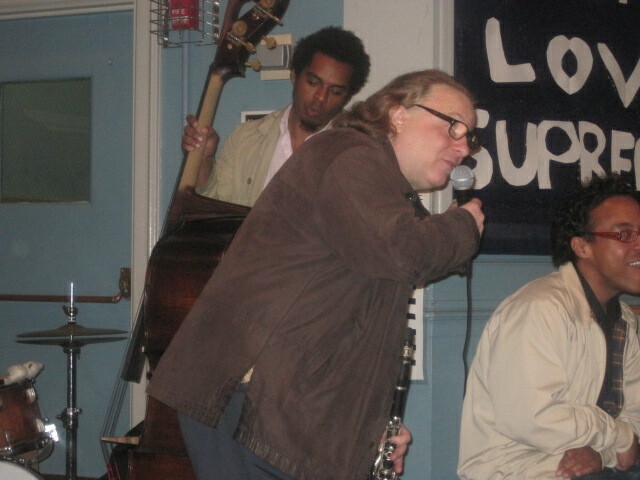 Louis Vig and the Debut Band playing John Coltrane songs for the children. 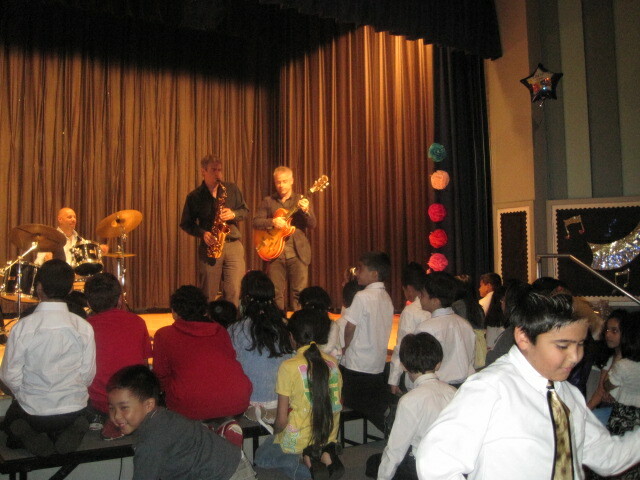 The children were treated to an exquisite jazz performance. The Kids for Coltrane and the Holliswood school community enjoying the sweet sounds of jazz. It was such a treat for me and the Kids for Coltrane to hear master guitarist Louis Vignpiano perform live on this spectacular evening. During the year the children and I write lyrics to his instrumental songs as we explore different ways to write a story. 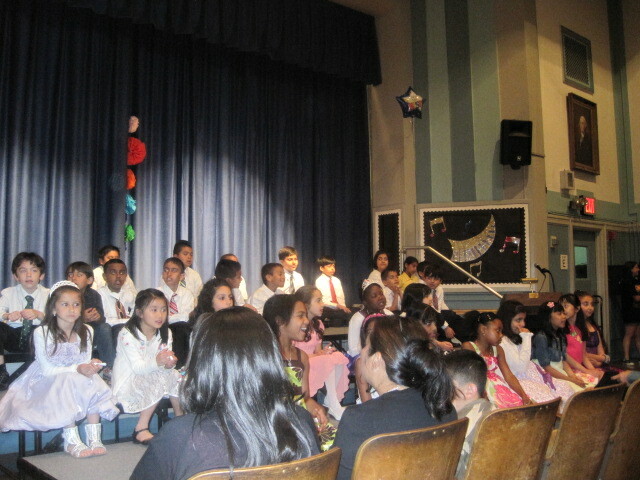 The children sang throughout the evening like precious angels. Included in our original lyrics is a song we wrote in honor of John Coltrane’s birthday. It was set to his great song Equinox. We call it Hamlet’s Child. The Manhattan jazz scene comes to the Holliswood School! Sean Harkness and his Quartet perform during our Gift of Song Concert. The children, their friends, family and the whole community yelled for an encore! 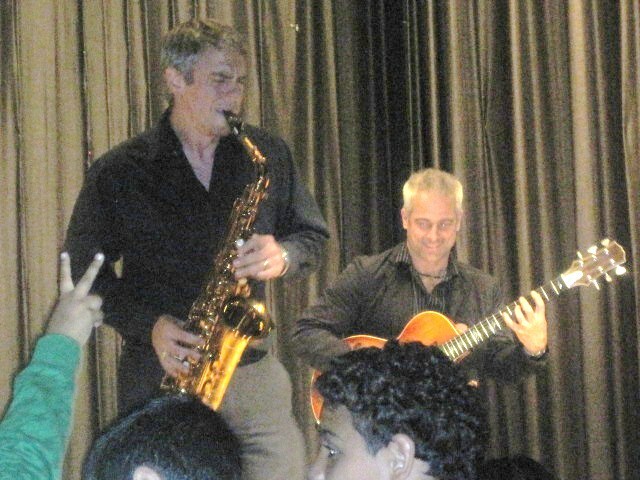 Gifted jazz saxophone player Rich Williams and gifted jazz guitarist Sean Harkness have the room swinging. 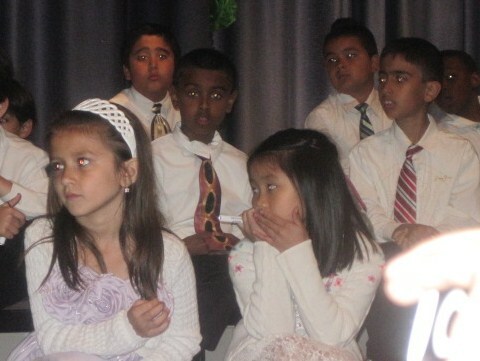 The Kids for Coltrane heard the colors flow through the room. Outstanding performances! A great drummer Darro “Sparkie” Sandler has the joint jumpin’ with his expertise on his instrument. Just incredible! 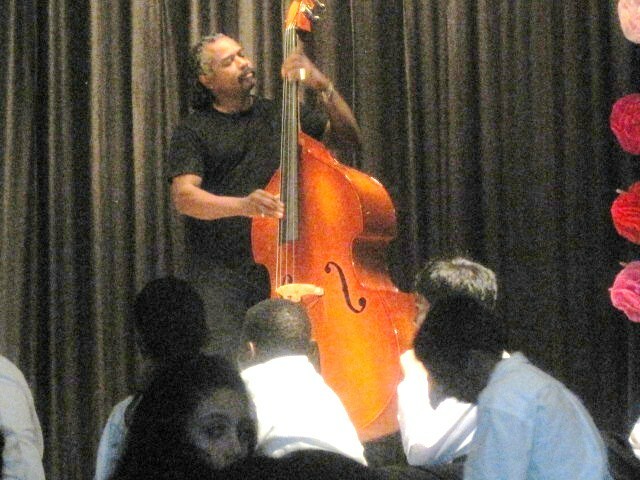 Freddie Simpson performs on the bass with the Sean Harkness Quartet to treat us to Naima and Mr. PC. and it didn’t stop there. Wow!! The Kids for Coltrane honored one of my heroes in music Mr. John Lennon and sang his song IMAGINE with warmth and love for the world. 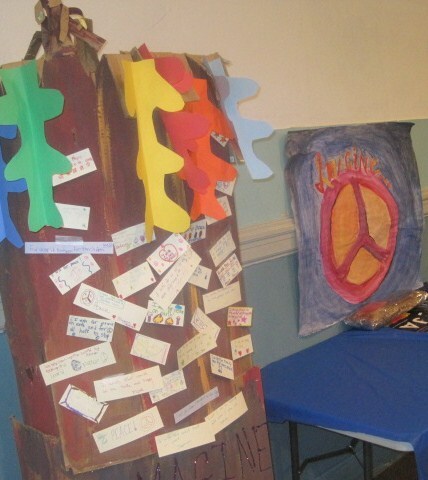 They created an Imagine tree and posted their wishes for the world on it. Yoko Ono sent over her Onochord lights for the children and the whole audience. During the evening while the children sang IMAGINE we lowered the house lights and the Onochord lights filled the room with love and peace…just so beautiful! 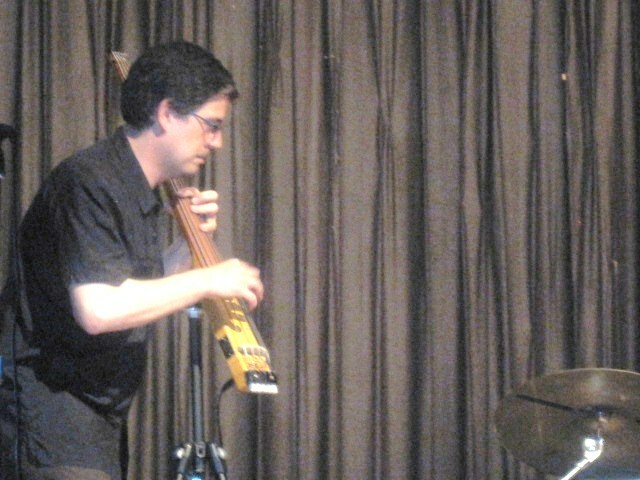 The blues, and jazz have influenced many musicians and many different genres of music. I am certain John Lennon would agree. Creating loving learning environments in which all children are appreciated for their uniqueness would have made John Lennon smile…this I am certain of! 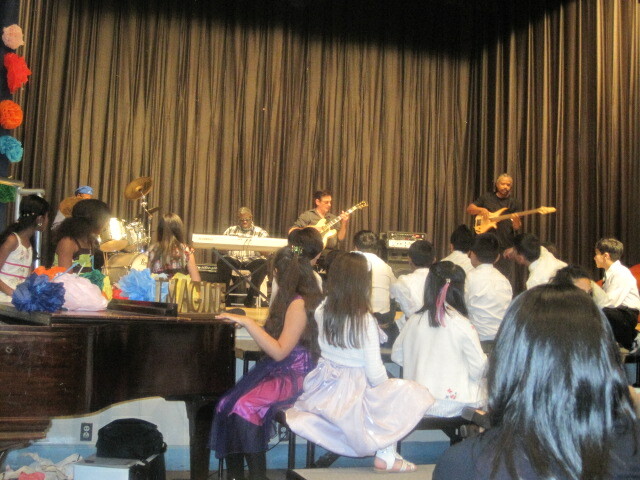 Our Dancing Classroom students joined us for a tribute to the blues and jazz. They danced with joy and ease to Fever and Hit the Road Jack. They were fantastic! Children and audience viewing our Kids for Coltrane Power Point which highlighted our work together over the last four years. The Kids for Coltrane enrichment groups are growing. 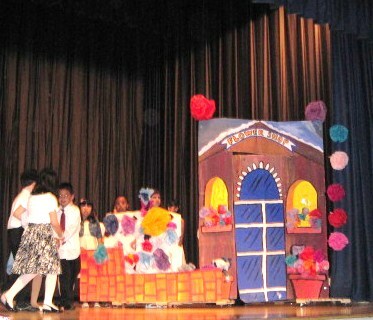 This show brought together second, third, fourth and fifth grade students learning through the Arts. 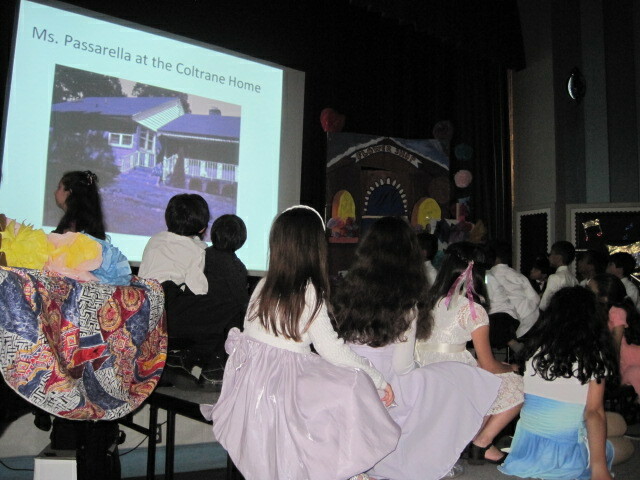 The slide above shows me, Ms. Passarella, the day I first went into the Coltrane Home. One day I hope to visit the Coltrane Home with the children when it becomes a learning museum. “Jazz speaks for life. The Blues tell the story of life’s difficulties, and if you think for a moment, you will realize that they take the hardest realities of life and put them into music, only to come out with some new hope or sense of triumph. This is triumphant music.” Dr. Martin Luther King, Jr. Thoughts of gratitude go out to Yoko Ono, Wendy Oxenhorn and Joe Petrocelli at the Jazz Foundation of America, Joann Stevens and the Smithsonian Institute, trumpeter Eddie Gale, students Sara Levine, Gregory Goodman, and Fred Stark our A/V Squad, our custodial staff, our school parents , the middle school art department, Madeline Pensabene, Santa Lee, our great teaching staff and our dedicated Principal Mrs. Ambert, and Assistant Principal Mr. Klocek. We are truly grateful to everyone who has been involved in the Kids for Coltrane Project. A special thank you to my son Anthony, and my daughter Victoria for helping me every inch of the way. A huge shout out to Nat Hentoff, Phil Schaap, and Jim Eigo for helping get the word out about The Kids for Coltrane Project in Education. It is very much appreciated gentlemen!! I wish Mr. Steve Fulgoni, and the board of the nonprofit Friends of the Coltrane Home all the best in their mission. I so appreciate your supportive words along the way. Thank you all for coming to our shows. 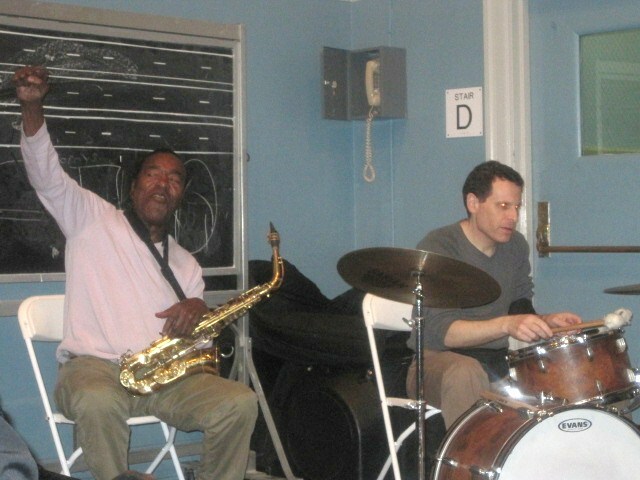 I hope in some way our efforts help you turn the Coltrane Home into a place of learning. If you are interested in helping them please check out the site http://www.coltranehome.org. We also appreciate the donations made for our raffle prizes and everyone who purchased tickets to support the Coltrane Home and the Kids for Coltrane Music Library at the Holliswood School. The dedicated Holliswood School PTA is always there for us. This year we welcome Mike Biegel to our project. Mike is a Vermont artist who donated a piece of his fabulous art. We also must thank Bobby Nystrom and the New York Islanders for sending over a very cool Islander Jersey. Our first prize was a beautiful acoustic guitar which was won by Holliswood school student Anna Davydov, congratulations to all the winners! A debt of gratitude to all the musicians who have encouraged and inspired me, especially the musicians who have created America’s music. My hope is that the genres blues and jazz are treated with the respect and appreciation they deserve. We thank the family of John Coltrane for sharing John’s love and brilliance with the world. It was lovely to have John’s cousin Randy Coltrane attend our Gift of Song Concert. Together we are bringing the gift of song to children. I am always grateful to Harvard University’s Dr. Howard Gardner and the Project Zero team for doing the research that informs my work. I am inspired by Peter Senge, George Lucas, and my cousin John Turturro. True examples of creative people who followed their own unique paths. Finally, my message to the universe is that every life must be valued to the utmost degree. Every child is precious! I am blessed to be called teacher. Working with my students has made my journey a dream come true! To my cousin Frankie Termini Orlando who left this earth too young… Your love and gentle nature live in my heart and soul. 1 Response to "♥ A GIFT OF SONG…A Concert for the Children"